Energy-efficiency, low level of harmful impact on the surrounding environment and a high degree of safety in freight and passenger transportation. In addition, SkyWay engineering solutions fit harmoniously into the existing infrastructure of any metropolis. 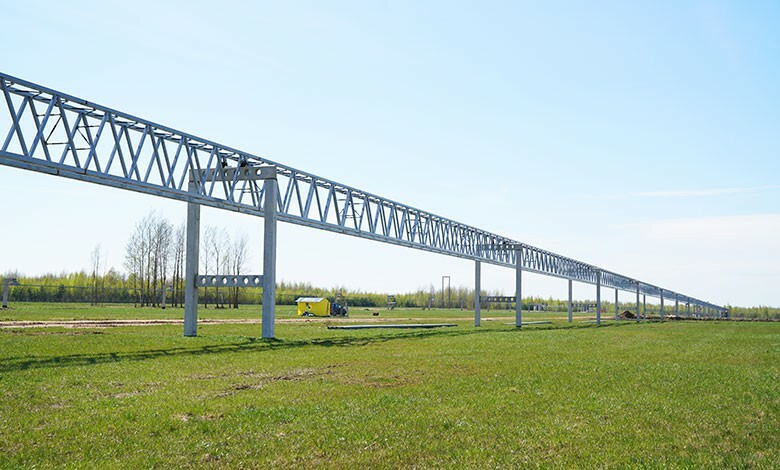 SkyWay is an elevated transport system, in which the traffic of vehicles is arranged by means of suspended, pre-stressed by tensioning continuous string rails stretched between supports. A string rail is characterized by high strength, rigidity, evenness, ease of manufacturing and mounting, low material consumption and a wide operating temperature range. 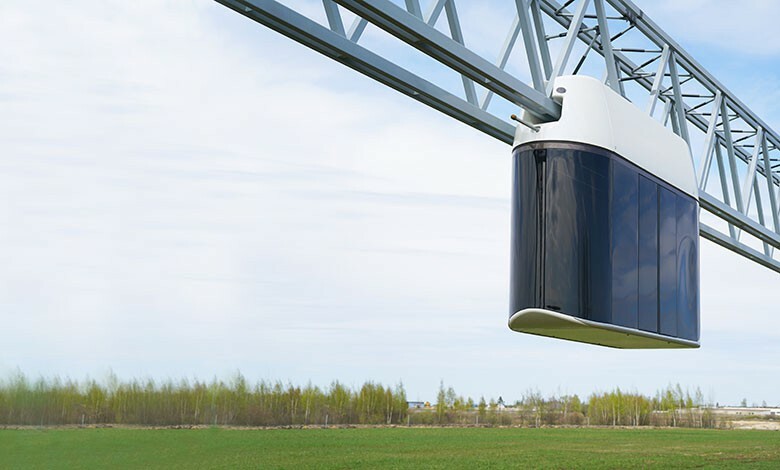 Special electric vehicles on steel wheels are used as transportation means in SkyWay communication systems. A string-rail track structure does not have joints and deformation (temperature) seams and is characterized by an excellent straightness and smooth curves that provide achievement of outstanding operational features of the transport system ― high travel speeds, minimal impact loads, and low energy consumption. Thanks to anchor (spans of 2-3 km or more) and intermediate (spans of 40-60 m and more) supports, the track structure is all the way located above the ground surface. 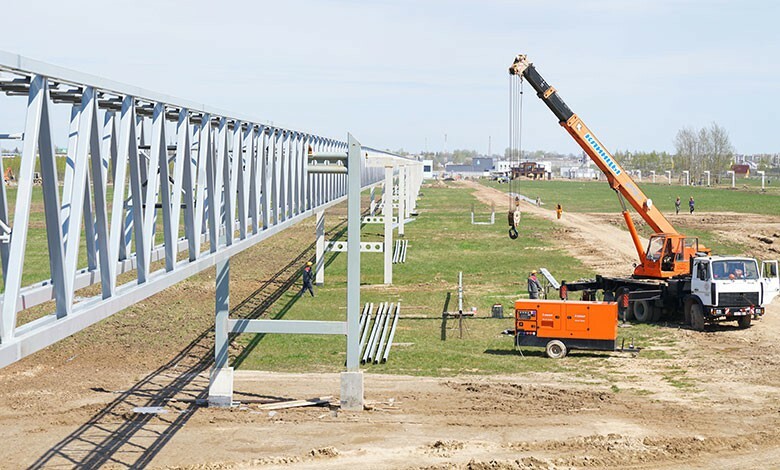 The location of the track structure above the ground is critical to reduce the cost of construction, careful attitude to the environment, as well as to ensure the highest level of safety in comparison to all other modes of transport. Key design distinctive features of this transport system compared to other types of roads of elevated version lies in pre-stressing the structure by tensioning, absence of a solid roadbed and low material consumption for construction and low maintenance costs. 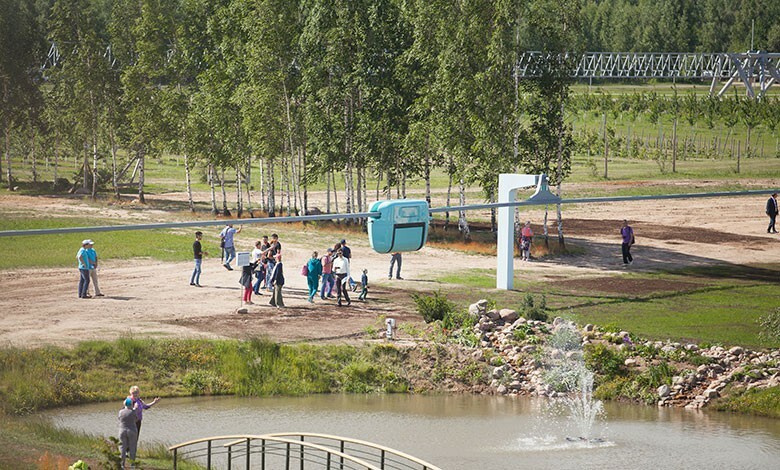 The main advantages of SkyWay transport are efficiency, environmental friendliness, durability, reliability, safety, and, as a result, high competitiveness on the market of transport services. 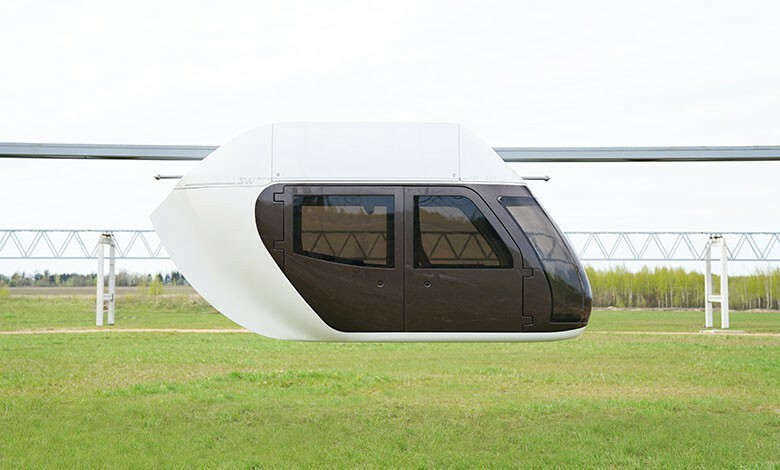 The urban SkyWay is an option of string transport intended for transportation of passengers and cargo within city limits, between a city and an airport, as well as to the settlements located at a distance of up to 200 kilometers. 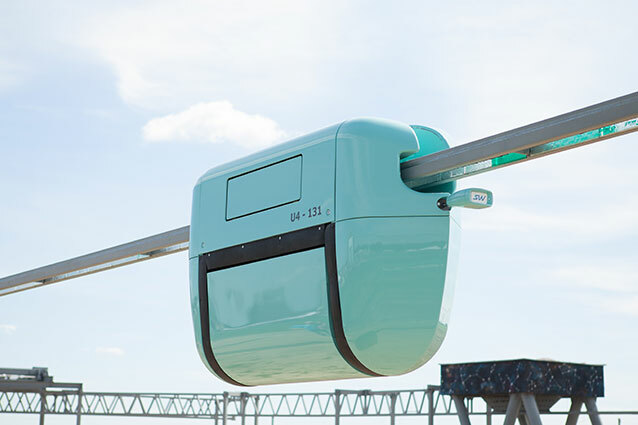 With the capacity of a single SkyWay vehicle up to 100 people or 10 tons, the system has the operational efficiency of up to 50,000 passengers per hour or 1,000 tons of cargo per 24 hours in one haul distance, which is comparable to the metro that is obviously more costly and resource intensive than a string-rail overpass. The rolling stock of urban SkyWay transport systems is represented by a unibike and a unibus. 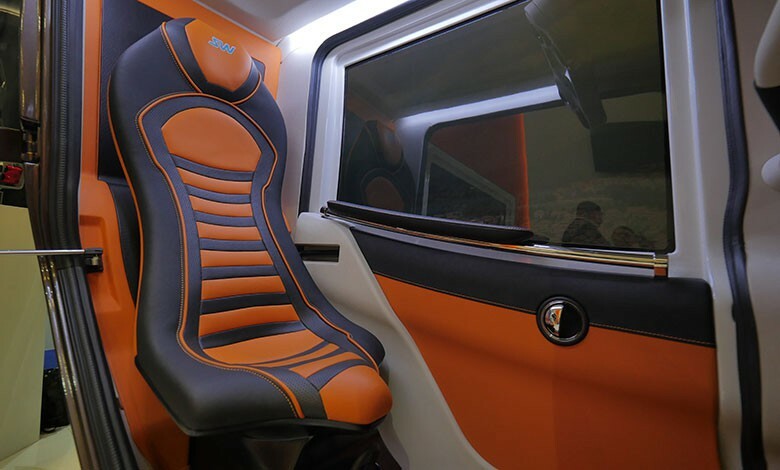 Unibike is a lightweight and compact vehicle of small capacity (up to 5 passengers) that can be used as both a personal urban transport and also as an element in the infrastructure of a sportsand entertainment facility. In addition to the on-board (and external) sources of energy, it has a bike-generator, due to which unibike can be driven in motion by muscular force of passengers. If only the muscular power of passengers is used, unibike speed can reach 50 km/h. The primary application area for unibike are recreational and restricted sites, resting facilities, tourist routes and local transport lines. With the development of technology and creation of required aboveground infrastructure, unibike can be used as a fully-featured urban transport taking an intermediate position between personal and public transport. In the future, unibike can become a high-speed personal and family transport. Maximal motion speed: 120–150 km/h. Performance capacity of the transport system: up to 50 thousand passengers/h and more. Maximum longitudinal track gradient: 30 %. Urban unibus has a capacity from 14 to 48 passengers (double-rail version) and the speed up to 150 km/h. The capacity of unibus may vary depending on the particular operating conditions and customer requirements. The cabin is equipped with the systems of ventilation, air conditioning, lighting, audio and video data to passengers and on-board automated control system. 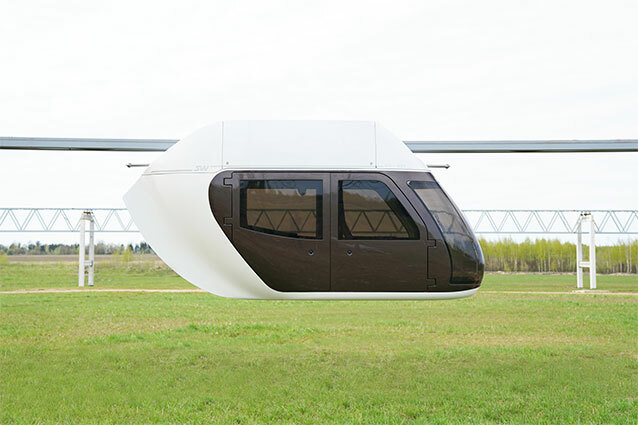 The urban innovative vehicle by SkyWay technology is based on the principle of modular designing of both nodal solutions and the structure of the rail unibus, as well as the unmanned control on the route based on the software control of the autopilot. The principle of modularity provides for the customer the possibility of optimal selection of rolling stock at minimum cost. Unibus can be operated under various climatic conditions at outside storage; its average service life is 25 years. The consumption of electric energy (in fuel equivalent) is up to 7 liters/100 km. Cargo transportation speed: up to 150 km/h. Performance capacity of the transport system: up to 200 mln tons/year and more. Cargo SkyWay has the same track structure as the urban one. Similarly, its main specific feature is that the overpass structure has a preliminary stretching. 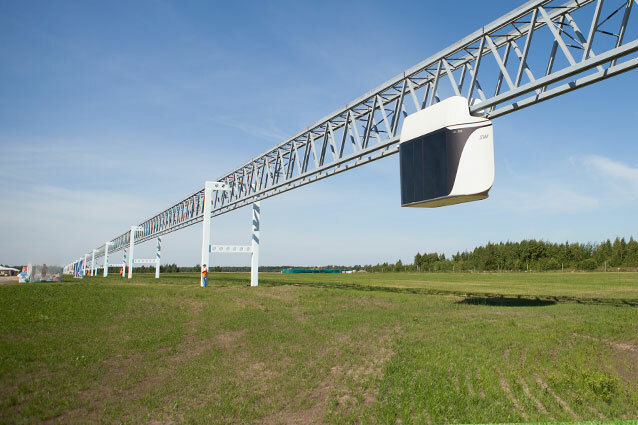 Therefore, the movement of urban cargo SkyWay can be performed on the same track structure as it occurs in rail or motor-road transport. Freight rolling stock is made on the basis of suspended urban passenger unibuses. There is also developed a special range of containers, fit to dock with sea, rail and motor-road containers for liquid, bulk, packaged and special cargo. 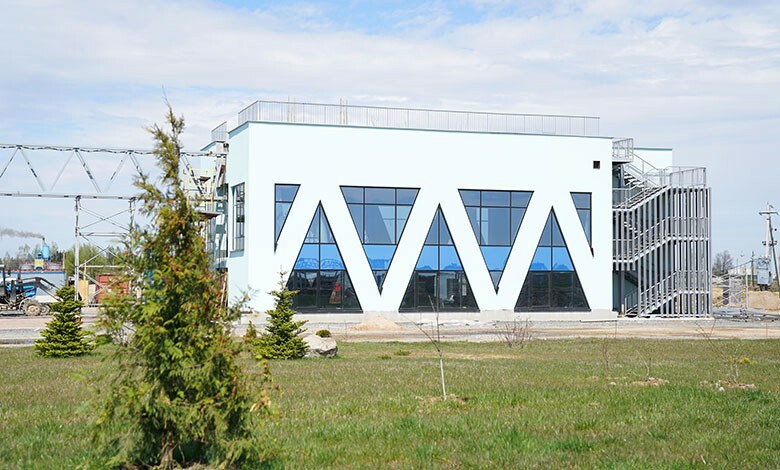 Containers for perishable cargo are equipped with a temperature-control system (in winter) and air conditioning (in summer); containers for environmentally hazardous goods are provided with a multilayer high-strength casing, etc. and explosive substances, weapons, etc. ).